This is a valuable and enterprising release, featuring a seemingly obvious coupling for the first time on CD. The Liszt ‘B minor’ is no stranger to the catalogue, but the rarer Reubke Sonata has also been lucky to have received some fine recordings in recent years, notably those by Till Fellner and Jeremy Filsell, the latter coupled with the Organ Sonata on the 94th Psalm. To be able to listen to two such fine performances side by side by a player who obviously possesses a strong affinity with this style lends this release a compelling authority. Reubke is one of the might-have-beens of nineteenth century music, tragically dying at the age of twenty four. It seems all the more miraculous then that he managed to write two such important and substantial pieces. The Organ Sonata is one of the staples of the repertoire, and is arguably a more successful work than his teacher Liszt’s Fantasia and Fugue on "Ad nos, ad salutarem undam" on which it is based. It has a thematic unity and economy of invention that is lacking in sections of the Piano Sonata, even taking into consideration the different resources. Perhaps he would have revised it if he had lived longer, a luxury Liszt was granted during his long life. Yet in such a sympathetic recording as this, its mixture of youthful exuberance and virtuosity more than make up for any structural question marks. Hewitt’s grasp of the narrative aspects of Liszt’s Sonata is strong, as is his ability to lend a sense of inevitability to each section. As I mentioned in the first paragraph, the number of recordings of this piece is bewildering, ranging from the devil-may-care Argerich to the more cerebral Brendel. 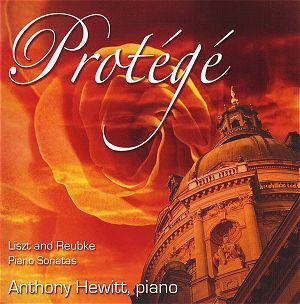 Hewitt seems to fall into the latter camp, being more intent to focus on the purely musical aspects of the score than in showing off his considerable technique. In his quest to achieve a unified interpretation - perhaps highlighted by providing just one CD track for each piece - I sometimes felt he under-emphasised the climactic moments, particularly in the slow movement build-up, but its fluency and drive are impressive on any level. For me this release is particularly valuable for the Reubke Sonata: its importance in the repertoire is not fully appreciated and such a recording as this will win it many new converts. The CD notes are informative and detailed and the recording is clean and truthful.